OnePlus just revealed that it's going to officially announce its next flagship smartphone - the OnePlus 5 - on June 20. The announcement will be livestreamed online, so everyone's going to be able to discover the OnePlus 5 in real time. 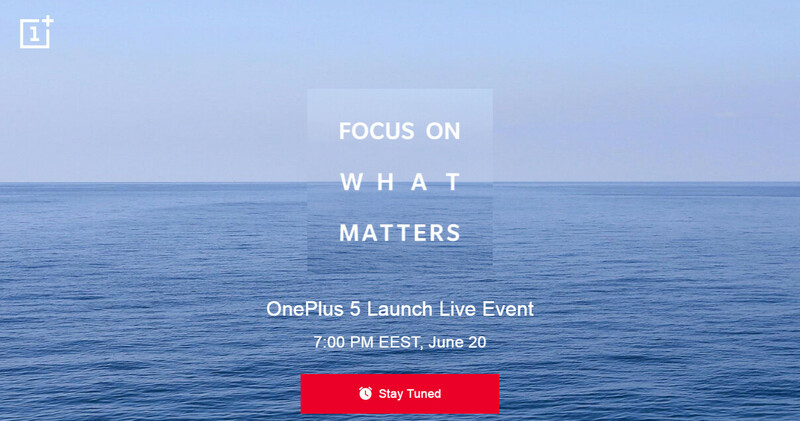 OnePlus already has a web page dedicated to the event - which will be held under the tagline "Focus on what Matters." The tagline and the web page (accessible via the source link below) suggest that the OnePlus 5 may have a rear camera with enhanced focus capabilities, and perhaps also with optical zoom (à la iPhone 7 Plus). Not long ago, OnePlus told us that the camera of the OnePlus 5 is made in collaboration with specialists from DxO, and the first official photo sample originated from this camera looks promising. While this is all we know about the camera for now, rumors have it that it's a dual lens camera (and it certainly should be, if it's true that it offers special focus and zoom capabilities). The OnePlus 5 will be powered by a Qualcomm Snapdragon 835 processor, and it looks like it's going to be smaller and thinner than the OnePlus 3T - which is neither too small, nor extremely thin anyway. We're assuming that OnePlus will start selling its new flagship smartphone shortly after announcing it. Until we find out more about the device, you might want to check out our OnePlus 5 rumor roundup. So that is 5pm British Summer time. Can't wait roll on 2 weeks, let's hope the photos live up the the hype when compared to LG G6 & Samsung S8. OnePlus camera hasn't particularly performed on par with the best ones... Not to say that OnePlus can't up the ante, but I ain't getting my hopes high. Exactly. Cant trust them either. Lets hope it lives up to the hype. I hope they won't sacrifice battery in reducing the thickness. That's all I care about. I'm sure everything else will be great. Seriously, increase the thickness by 2 mm but make it 4,000 mAh battery and I'm buying it. Where are these throngs of people that like their phone dying at 6pm unless they've plugged it in sometime throughout the day?